"Baoh must live! Baoh must die!" Genetic engineering never seems to pay off, at least in cautionary sci-fi tales. Vaguely similar to Akira, Baoh The Visitor tells a short but effective story of scientists tampering with nature, then paying the ultimate price for doing so. As the story begins, a young girl named Sumire is eluding capture by a group of mysterious individuals. As we soon find out Sumire is escaping Doress, an organization dedicated to creating ultimate warriors with psychic gifts, or "Baoh", special beings that turn much more powerful when threatened. The girl unwittingly causes their premiere Baoh to awaken, who destroys some of their best soliders, then escapes with Sumire. Fast forward a bit later, and Sumire and this Baoh are still on the run. The Baoh is Ikuroo, an average, everyday, Japanese teenager. He has no memories and doesn't understand why Doress wants him either, but he sticks with Sumire since she has a bit of money and is also able to sense when they're in danger. Eventually, they both realize their value to Doress and why the organization wants them back. In order to capture (or kill) them, Doress uses their best warriors, including a professional assassin, a robot, and a giant, super-psychic Native American named Walken. Running at around 50 minutes, Baoh isn't really a very in-depth story exploration, but rather an active, action-packed story. 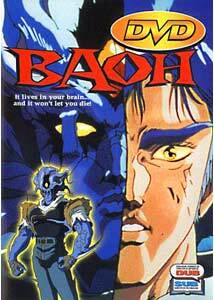 Like most short anime, Baoh follows a fairly predictable flow: a brief setup, a period of action followed by some kind of heavy threat to a central character, then an explosive finale that brings closure to the whole thing. That's not to make Baoh sound bad simply because it's familiar; it's very entertaining and very well made. Some viewers may be turned off by the extreme violence, however, with Baoh being one of the most gory animes I've seen in quite some time. Still, if you're in the mood for something short and to the point, you really can't go wrong here. There's a decent story, suitably weird characters, and it's all packed into under an hour. Artistically, the show is nicely presented with some very detailed animation that obviously goes a bit beyond some of the usual series-type anime. Baoh makes a good, short trip and it's definitely a postitive thing it wasn't stretched out much longer, as I don't think the story could have supported it. It isn't perfect, but it's as close to perfect as a nice, compact adventure can be. Image Transfer Review: The source seems murky in certain scenes, leading to some obvious compression artifacts in many places. This does not have any major effect on the program, but it is easy to see some of the weaker moments, which are slightly aggravated by dot crawl on some edges and moire "rainbow" patterning in places. The transfer still remains solid, though, keeping a clean image that captures all the colorful scenes and bloody action sequences. Audio Transfer Review: The stereo track offers a nice, clear, energetic experience that really works with the fast-paced nature of the film. It's quite vibrant and retains the dual-channel nature of stereo much better than a lot of 2.0 mixed soundtracks, which tend to collapse a lot into the center channel. There's good directionality and activity, and at louder volumes, it really delivers a considerable impact. The only minor complaint is that the low-end seems a bit flat and without the punch you'd expect. Extras Review: The included supplements feature an alternate credits list and a gallery of cel photos. The credits (which also play after the entire film) are a complete translation of the original credits, it just seems AnimEigo opted to make them separate rather than subtitle them on the feature. The cel gallery is basically what it sounds like. It runs in real time for about 50 seconds, and features scenes from the film. The keepcase contains an index card-like insert explaining the core plot and its relationship to the original manga (Japanese comic), as well a few tidbits of trivia and the English translation of the end credit song lyrics. Baoh is definitely a recommendation for anyone who likes their anime fast and furious, with little fluff around it.